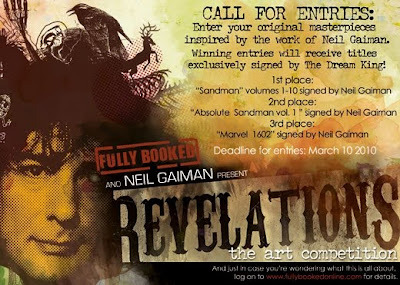 Enter your original masterpieces inspired by the work of Neil Gaiman. Winning entries will receive titles exclusively signed by the Dream King! Entries must be delivered on or before March 10, 2010 with a duly accomplished entry form. 1. Artwork Entries should be at least 11" x 17" (A3 size), but should not exceed 17" x 22" (A2 size), v. Vertical or horizontal orientation will be accepted. The artwork entries should be mounted on cardboardillustration board , posterboard, or foamboard, with overall dimensions not to exceeding 20" x 25". 2. Entries must be an original artwork. Usage of copyrighted material is strictly prohibited and is subject to immediate disqualification. Entries with inappropriate language or subject matter will not be accepted. Previously published, displayed , or prize-winning artwork may not be submitted. 3. Any media may be used. Artworks should be no more than 4 inches in depth and are suitable for hanging. 4. A completed entry form must be attached to the back of the artwork. 5. There is no fee to enter the contest. 6. All reproduction rights to all of the submitted artwork will remain with the artists. However, all prize winners shall agree that Fully Booked be granted non-exclusive reproduction rights for advertising, promotion, website, and print publication purposes. Prize winners also agree to allow Fully Booked to use his/her name and/or picture or image without limit in conjunction with his/her entry into this contest. 7. All rules and guidelines of the contest must be followed strictly. Non-compliance will subject the entry to immediate disqualification. Winners will be announced on March 17, 2010 during the 3rd Philippine Graphic Fiction Awards Night at the Rockwell Tent in Makati City. 1. Selected artwork will be on display in Powerplant Mall until March 21, 2010. Artwork should be picked up at Fully Booked Bonifacio High Street by March 31, 2010. Entries not picked up after March 31, 2010 will become the property of Fully Booked, and can be disposed of at their discretion. 2. All judgments are final and interpretations of the guidelines are at Fully Booked's sole discretion. 3. All employees of Fully Booked, Sketchbooks, Bibliarch, its credited advertising agencies and suppliers and their relatives up to the second degree of consanguinity and affinity are disqualified from participating in this contest. 4. Fully Booked reserves the right to nullify any entry submitted if conditions are not met. Such conditions may be incomplete forms required, falsification of required documents, or fraudulent sales transactions, and other illegal conditions initiated by the entrants. You can also download the Art Contest Entry Form from Fully Booked site.